On a recent episode of Drew Coffman's Whims That Work, the guys discussed Dropbox.design. If you haven’t seen it yet, it’s where Dropbox (the company) takes some time to talk about their brand and how it’s evolving. And if you read between the lines, you can see that this is about a lot more than color palettes and typefaces. Drew and Joe talk about how this move from Dropbox feels odd. And if you’ve been using Dropbox (the utility), that would make sense. Drew stated that he wonders if Dropbox is “starting” to work on collaboration and creativity tools and Dropbox.design is an attempt to shift how people think about Dropbox as a whole. However, if you’ve used Dropbox Paper at all, this entire direction would feel more clear. When I joined Wildbit, the team was using Hackpad regularly for shared documents. It wasn’t too long after I joined that Dropbox acquihired the Hackpad team and a couple months later, Paper arrived on the scene. We’ve been using Paper ever since it was available (and were a part of early research calls with the Paper team) and it has steadily improved as an overall tool. Paper started as a collaborative writing tool for teams. Today it feels like a little bit more than that. Dropbox the remote file storage & syncing service feels like a utility that is less of a life saver in 2017 than 2008. Mostly because all the big players seem to have this solved (even Apple). But Dropbox Paper is something different. After Editorially died, there was a gap in tools for teams (don’t you throw Google Docs in my face, you charlatan) when it comes to writing. Paper feels that void and has been a breath of fresh air. And it has been evolving since the day it was first available. Where it was document focused at first, it now enables teams, includes folders and projects, and even allows you to manage tasks. In fact, it has improved so much in this last regard that I’ve given it some consideration as a main task management tool. To my comment above about not being sure what “paper” Drew and Joe were referring to in episode 11 of Whims That Work, I was thinking Dropbox Paper at first. You’ve long been able to create a task in a Paper document. But in recent weeks, the Paper team has added a Task icon to the main menu in Paper. Click on that icon and you get a nice view of all your tasks across multiple documents. And you can view tasks you assigned to others, or tasks that are assigned to you. In all the services I’ve used over the years, there has been a gap between managing the actual tasks and the information that is required to work on those tasks. There always needed to be a secondary piece of software required. That might be apps like Yojimbo or Evernote or Ulysses, or it might be parts of the macOS (files/folders in Finder). Things 3 is the first tool that made me think there was a chance I could handle it all in one place. 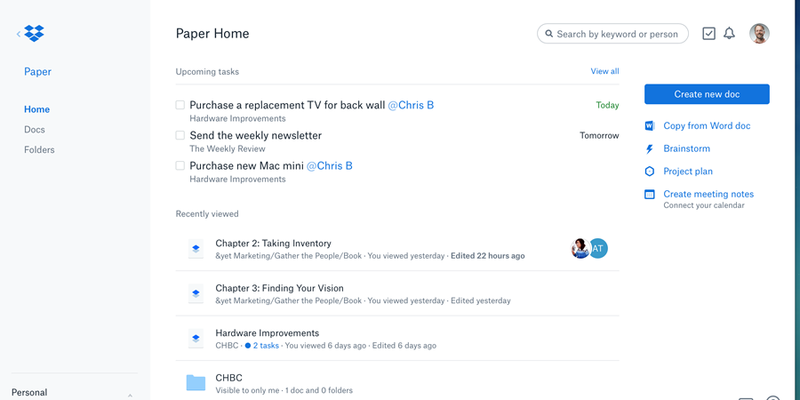 But where as Things takes managing your tasks and allows you to flesh out a project or task to include some thoughts, Dropbox Paper adds a layer of task management on top of your documentation. I’m not sure I’d be ready to use it in this way full time, but it has got me thinking. And when it comes to writing, Paper is a fantastic experience. Our team writes more because of it (those people for whom writing is really painful have been writing more because the experience feels good). I’ve written a ton of micro-copy for our new product Conveyor, everything from transactional emails to Slack integration notifications to placeholder text in the Mac client and web app, and kept it all in one very long Paper doc. For a web based app, Paper is robust and enjoyable. If Dropbox, as a company, can continue to build experiences like this, I feel good about their chances to evolve from a behind-the-scenes utility to something more.